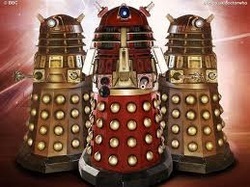 Daleks were the mutated descendants of the Kaleds of theplanet Skaro. They fought the Time Lords in the Last Great Time War, ending in the near-total destruction of both races. Regarded by the Doctor as his greatest enemy, the Daleks were hated and feared throughout time and space. They were the oldest and most frequent foes of the Doctor, having faced him several times in every one of his incarnations. Although the Daleks looked entirely mechanical, they were in fact cybernetic organisms or cyborgs, with a biological body sheathed in and supported by a protective outer shell ofDalekanium metal armour, armed and mobile. In this respect they were somewhat similar to a Cyberman; unlike them, the Daleks' bodies had mutated so drastically from their Kaled ancestors they had lost all humanoid appearance, save for one eye. The Dalek casing, originally called a "Mark III travel machine", could be seperated into three sections. Top: The Dalek's means of vision and communication, a dome with a set of twin speaker 'lights' (referred to as luminosity dischargers) [source needed] on the upper part of the sides and a telescope-like eyestalk in the middle. This was attached to the mid-section by a "neck"
Mid: On the Dalek's "chest" the Gunstick & Manipulator arm were attached. These provided the Dalek's means of offence and operating capabilities. Bottom: The Dalek's means of mobility was a sturdy base with a skirtlike structure of plates covered with globes. This allowed movement and, in later models, flight. The creatures inside their "machines" were almost always Kaled mutants, which the Seventh Doctoronce described as "little green blobs in bonded polycarbide armour". Mutated members of other species, including humans, also occupied the casings on occasion. The lower shell was covered with fifty-six hemispherical protrusions, which could serve as a self-destruct system (DW: Dalek). Although they were nearly invulnerable, Daleks had several exploitable weaknesses. These changed and varied depending on the Dalek's type. 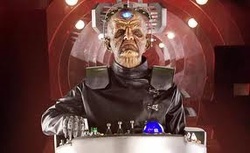 HISTORY Davros, creator of the Daleks. (DW: Genesis of the Daleks)The Daleks were the product of a generations-long war between the Kaled and Thal races. Dalek Invasion of Earth) also vanished, enabling Daleks to move under their own power. Daleks had little individual personality and a strict hierarchy. They were conditioned to obey a superior's orders without question, even if these orders resulted in pain or death. (BFA: The Curse of Davros) The most fundamental feature of Dalek culture and psychology was an unquestioned belief in the superiority of the Daleks. Other species were either to be exterminated or enslaved, and then exterminated when no longer necessary. The default directive of a Dalek was to destroy all non-Dalek life forms. Another result of this superiority complex was their complete ruthlessness. This was due to genetic modifications made to the original Kaled mutants by Davros. It was because of this that it was nearly impossible to negotiate or reason with a Dalek and it was this single-mindedness that made them so dangerous. The key item of Dalek technology was the casing, derived from the Mark III Travel Machines built by Davros. The casings of Davros'Imperial Daleks were made out of bonded polycarbide. (DW:Remembrance of the Daleks) The eyestalk of the casing bestowed superior vision to the Dalek creature. The plunger-shaped attachment functioned as a flexible and adaptable limb. (DW: Dalek) Dalek gunsticks could kill almost any sentient being and could paralyse their victims temporarily or permanently. The Dalek's gunstick evolved alongside other aspects of Dalek technology. When the First Doctor met them in the Dalek City, the gunstick seemed to have the same qualities as a human gun. Extermination was not always guaranteed and some targets would be merely wounded. Dalek travel technology varied over time. Dalek spaceships were (almost) consistently designed in a saucer shape, (DW: Bad Wolf / The Parting of the Ways, The Stolen Earth / Journey's End, Victory of the Daleks) and hoverbouts allowed individual Daleks to travel without using their own power. [source needed] The Daleks also developed time travel capabilities. Time Corridors allowed limited transport between one era and another. (DW: Resurrection of the Daleks) The Daleks also developedtheir own kind of time machine of similar capacities to the Doctor's TARDIS, though they could not change shape.